The afternoon flew by! I snacked on a new yogurt to hold me over until dinner. I had no idea what to expect from the yogurt, but it was the first time I had seen it in the yogurt aisle! I was plesantly surprised by Siggi’s! It was super thick and creamy. 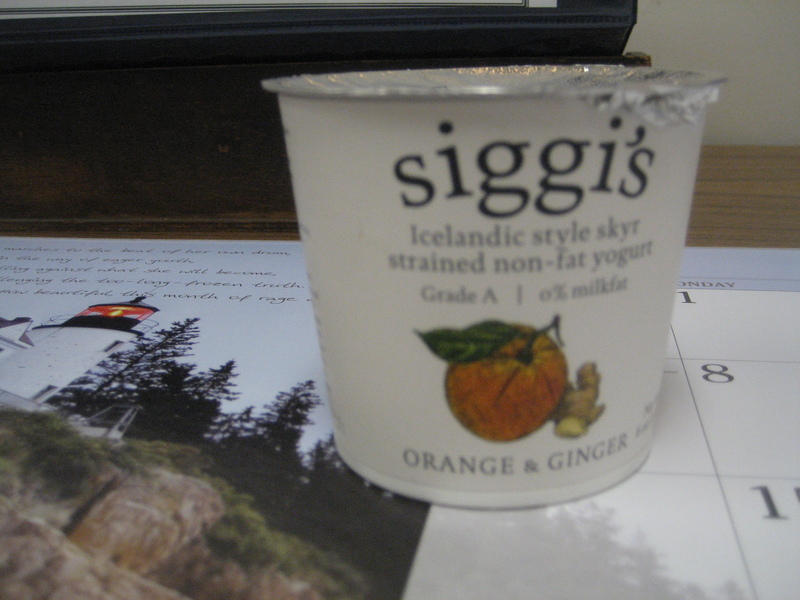 I loved the orange & ginger flavor – it did not taste one bit artificial like many flavored yogurts do. I immediately went to the website to find out more about this Icelandic style skyr. 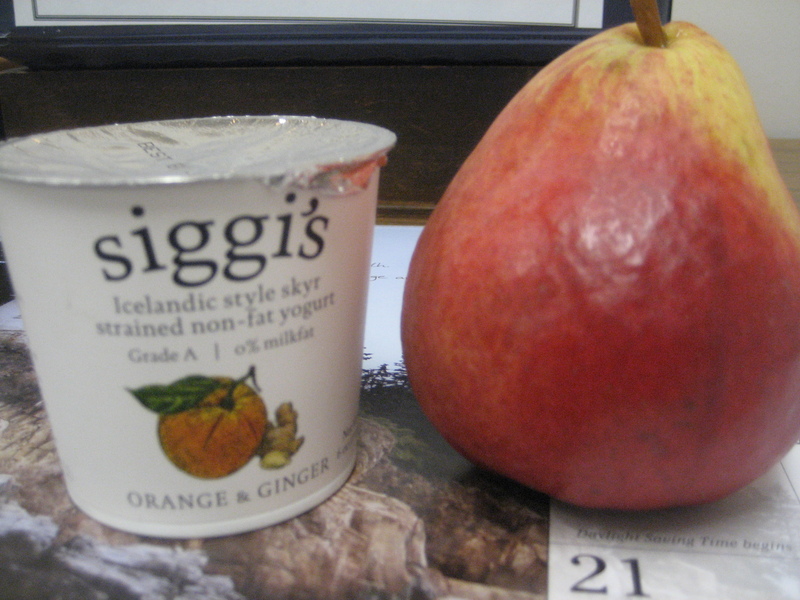 Skyr is the traditional yogurt of Iceland. It is made by incubating skim milk with live active cultures. The whey, the water naturally found in milk, is then strained away to make for a much thicker, creamier, concentrated yogurt. So to make just one cup of skyr, with all that water going out, you need 3 – 4 times the amount of milk required to make a regular cup of yogurt. As a result of this process skyr comes out with 2-3 times the protein count of standard yogurt. They are not kidding about the protein. This 6 ounce cup provides 16 grams of protein! It would be a great post workout snack. And, the paper label peels right off of the yogurt container for easy recycling. The downside is that is is expensive. This little yogurt cost be $2.29! 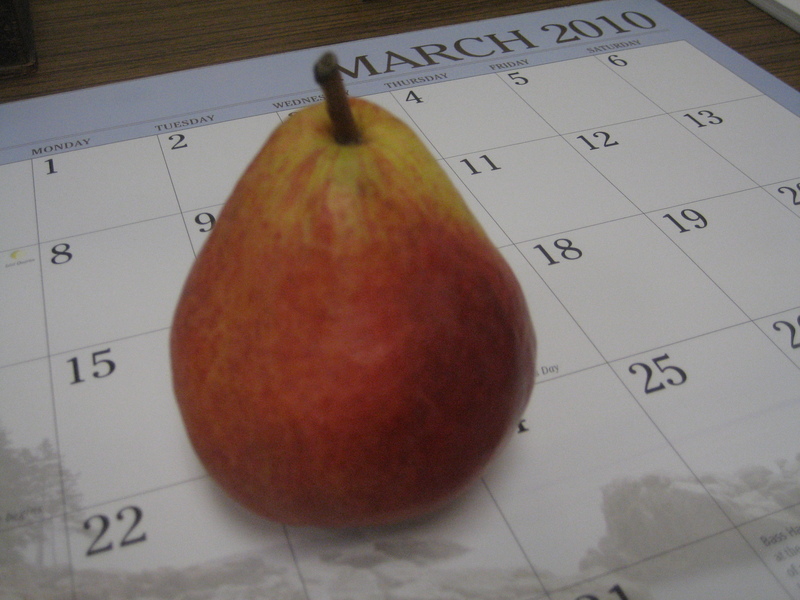 Along with my yogurt, I snacked on a pear. It was so sweet, which paired nicely with the tartness of the yogurt. 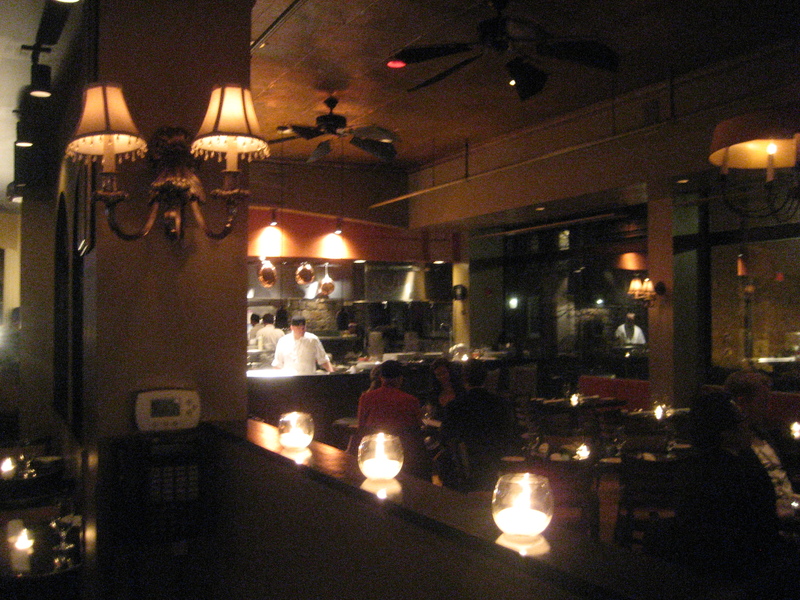 I love the atmosphere in this restaurant. The bar is very hip, and the kitchen is out in the open. 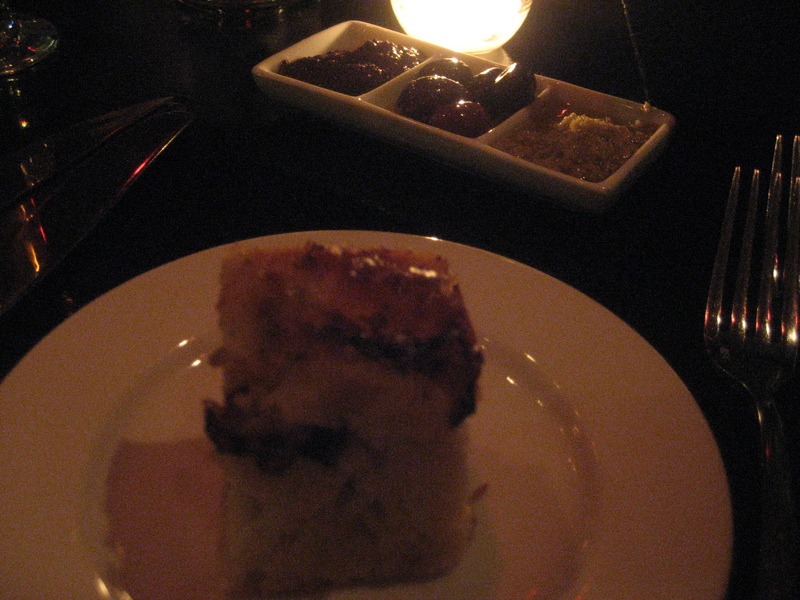 We started with some bread that was brought to the table. 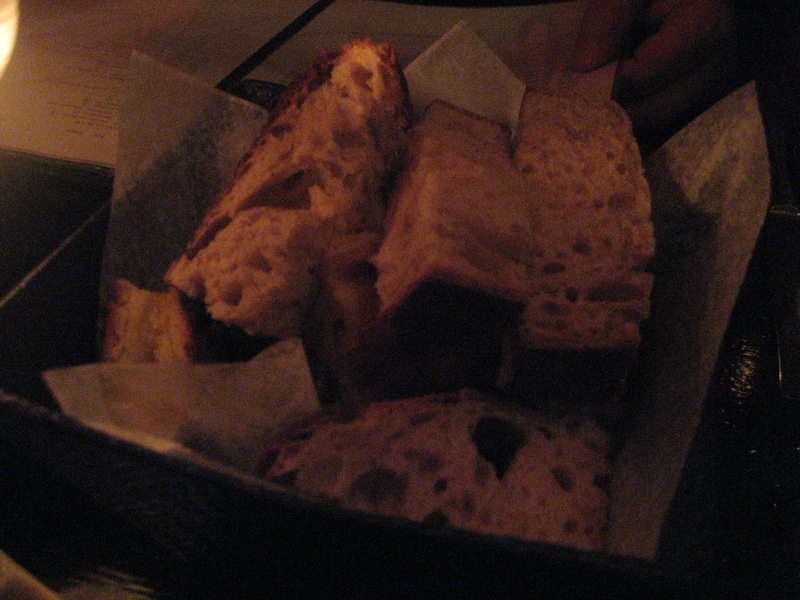 The foccacia was delicious, but very garlicky! I got the Greek Romaine Salad for a starter. It contained romaine lettuce, red wine vinaigrette, cracked olives, tomatoes, cucumbers and feta cream. 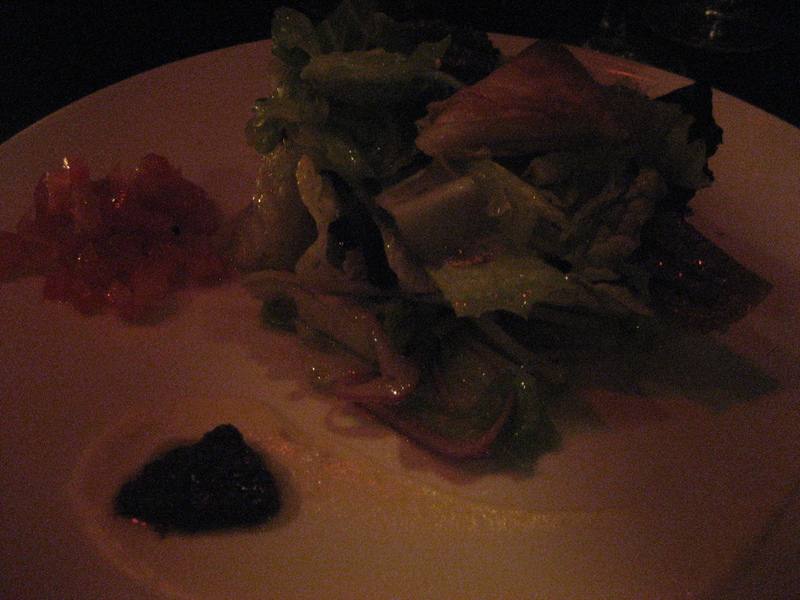 It came as a deconstructed salad with the pieces all around the plate. It tasted great, but as usual, there was a lot of dressing on the greens. 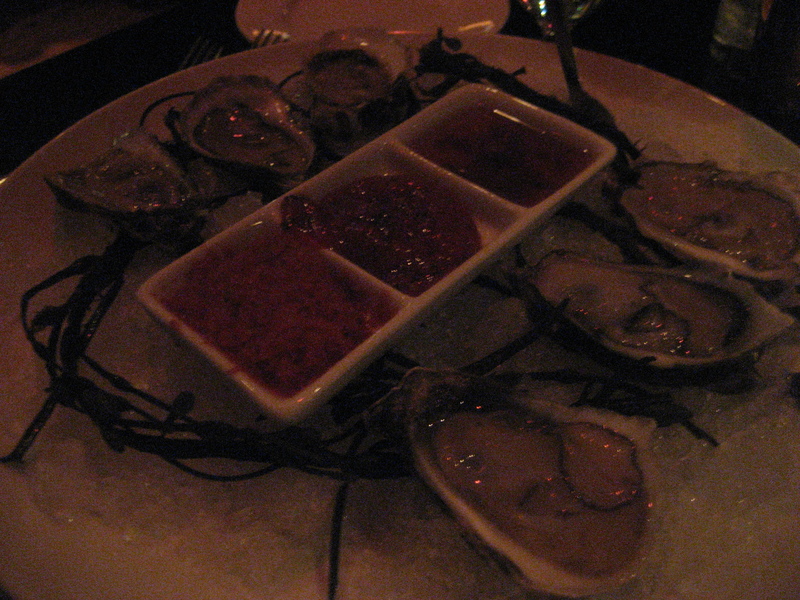 Brant ordered the Duxbury Oysters, which he loved! 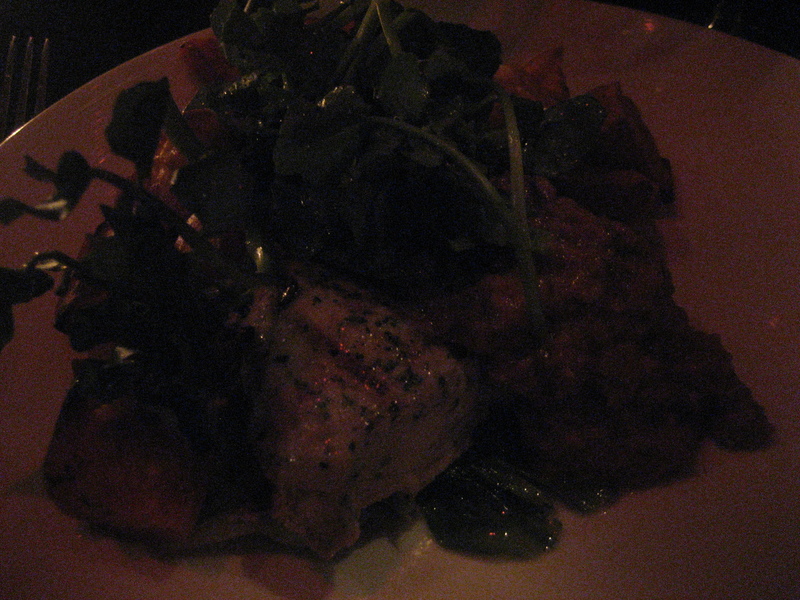 For my entree, I ordered the special: Wood Grilled Swordfish, which came with garlicky escarole, mashed potatoes and a tomato based sauce. I swapped out the mashed potatoes for the maple roasted sweet potatoes. This meal was absolutely delicious! The fish was cooked perfectly and was complimented by the sauce. The sweet potatoes were to die for! 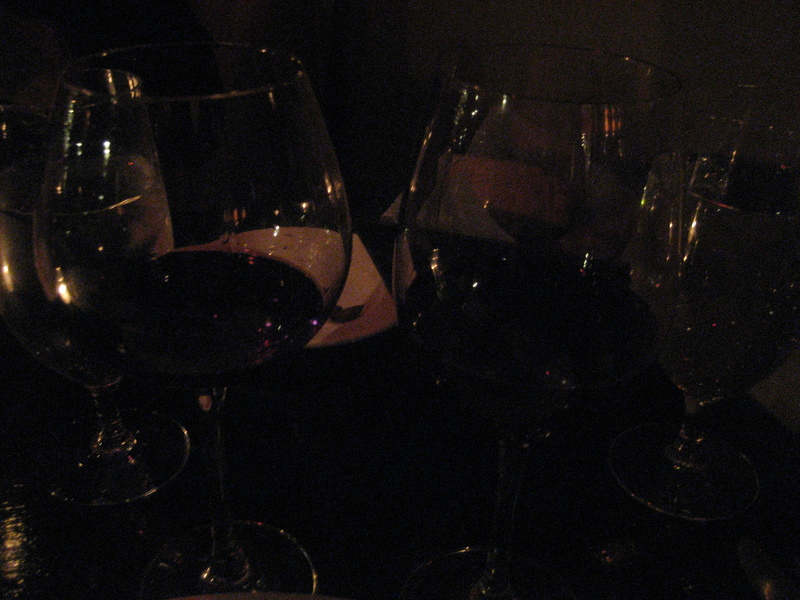 I enjoyed 2 glasses of wine over the course of our dinner, but you’d never know it from the super dark photo! Then came dessert! 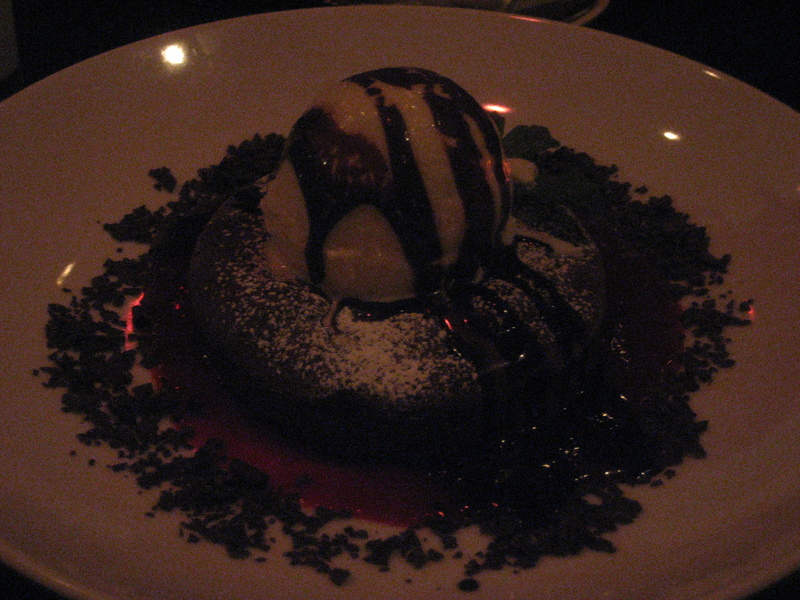 Falling Chocolate Cake with vanilla ice cream and raspberry sauce. We all split this. Obviously, I loved it! We had a great meal at Olives. I highly recommend this restaurant. 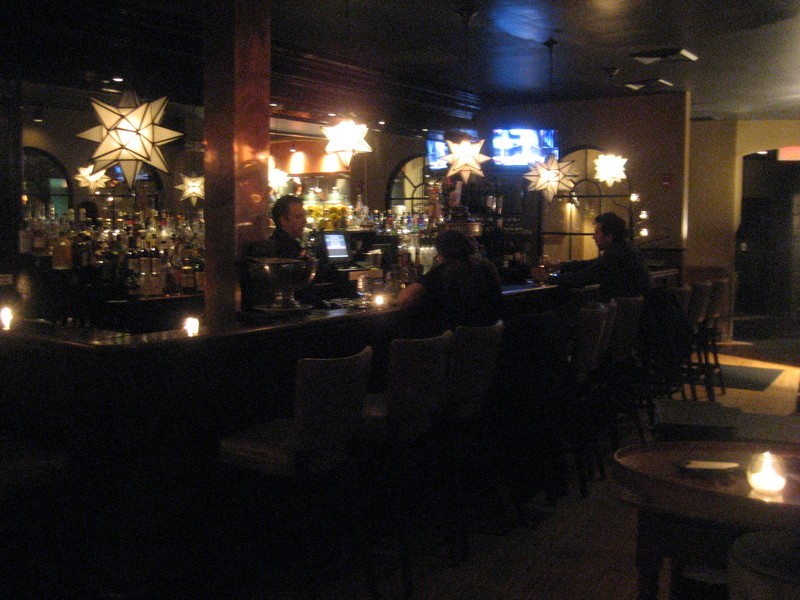 The atmosphere is great and the staff is really knowledgeable. Plus, the food was great!! I wish I would have split that dessert with you! Your dinner looks so good. 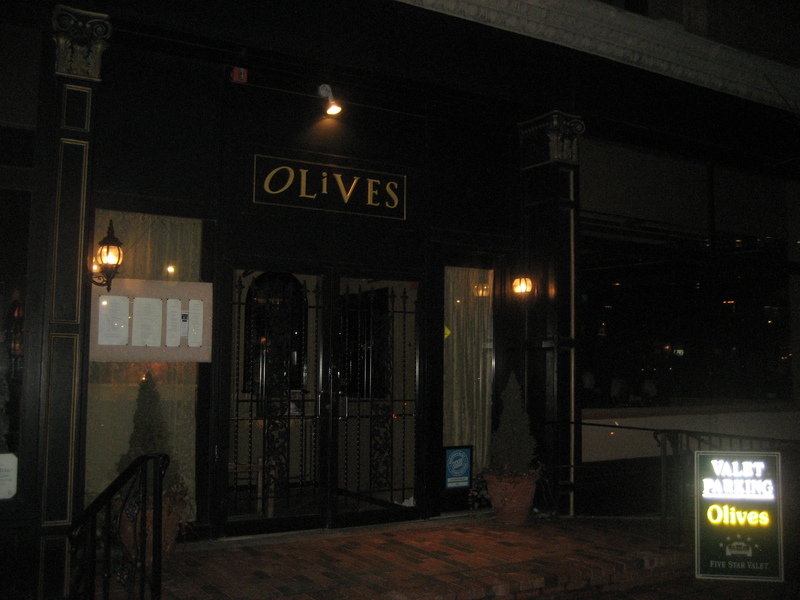 I’ve been wanting to go to Olives forever! Glad you enjoyed it. Thanks for leaving me a comment on that beer post. It was so weird having no comments on it… glad I have a few now. I was wondering if people decided to boycott it or something, haha. Oh and congrats on the 10 miler yesterday. That’s awesome! !